I've covered Suntory products in two previous posts. While I highly recommended the Yamazaki 12, I basically had a whisky fail with the Hakushu 12. Either I received a warped sample or my senses missed the grand notes others had found (of course, that post has had seven times the views of the Yamazaki 12 post). 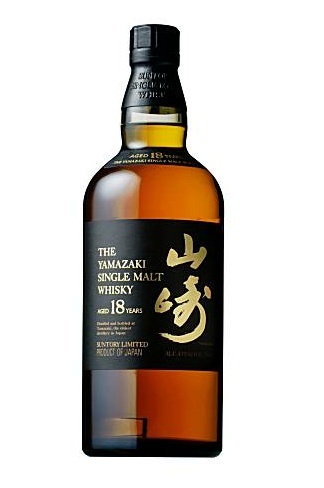 I figured the Yamazaki 18 would be out of reach, due to pricing and the news of its impending U.S. scarcity (now confirmed by two major LA spirits buyers). Thus I put it on my Dram Quest list; and, yes, I am now able to cross that one off. Let's take a look at what makes this whisky so splendid. I say, it's the big wood. Usually I blather on about distillate-this and distillate-that, but this time I cannot not talk about oak. First there are the sherry butts which tend to be at least twice the size of bourbon barrels. There's less spirit contact with the wood which may slow maturation down a little, but it imparts chocolatey and dried fruity characteristics. Then there are the toasted American oak puncheons which are also much bigger than the usual bourbon barrel, so maturation slows here too. By toasting rather than charring the oak, there are often fewer vanilla characteristics and more citrus notes. Finally there are the very rare Mizunara (Japanese oak) puncheon-sized casks. As per master distiller Mike Miyamoto (in 1001 Whiskies), Yamazaki "can only make 200 Japanese oak casks per year because of the scarcity of the timber". Thus the amount of mizunara-aged whisky in the final bottling is relatively low. But it's very rich, imparting unique spice notes that we (read: I) might automatically think of as specifically Asian -- a little sensory shorthand as we (again: I) struggle to label the experience. So how about the final product? The color really is almost as dark as the picture above; a reddish maple syrup. The nose begins with a big sherry and bright sugary wood effect. Then a creamy dessert wine. Glue fumes, but in a good way (don't pretend you don't know what I mean, huffers). Then there's something like a sweet Mirin wine or a sweet soy sauce, followed by a little leather, and a rich amaretto. Then there's the palate. At first, it's a mouthful of caramel sauce. Then cherries, caramelized sugars, and a touch of barbecue sauce. Then fresh sticky toffee and stone fruits. It is BIG and desserty. It sent me into a sense memory of standing in a cake bakery when I was child. Did it really happen? I don't know, but it was intense. The great unusual (mizunara?) sweet oak goes on forever in the finish. I could still smell it in my head hours and hours later. The juicy stone fruits (think ripe plums and nectarines) floated in the finish as well. In fact, it's luxurious. Other than, perhaps, the Bowmore 25yr, I've never had a whisky that felt luxurious. I've sampled older, more expensive, "luxury" whiskies but nothing quite like this. In the coming weeks and months (and years? ), I will sound off on the terrible pricing in the single malt market. But this here, The Yamazaki 18, is on another planet. And, despite its scarcity, it's still cheaper than The Macallan 18! One of the online retailers I usually buy from still has it for $96, so I might have to spring for a bottle the next time I order from them. I like the 12 year a lot and I've heard nothing but praise for the 18 year old. There's one LA-area retailer here that has it for $96 too. I'm a big fan of the 12yr as well. The 18yr is really rich and desserty. I'm not even a sweet whisky fan and this one knocked me over. Hopefully someday I (or you!) will be able to do a side-by-side comparison to see how the 12 compares to the 18.